This entry was posted in Series and tagged go oveboard, I didn’t realize it., I'm sorry, She’s a little sensitive so please don’t ask too many personal questions., That’s not funny. You’re dirty joke went too far., to do or say something beyond normal social etiquette that makes other people feel uncomfortable, to feel offended, to go overboard, to go to a considerable degree too far, to go too far, too overboard, You’ve went overboard and my feelings were hurt., 그녀는 좀 민감하니 사적인 질문을 너무 많이하지 마세요., 당신은 도가 지나쳤고 제 감정이 상했어요., 도가 지나치다, 미안해요, 부아가 나다, 재미 없어요. 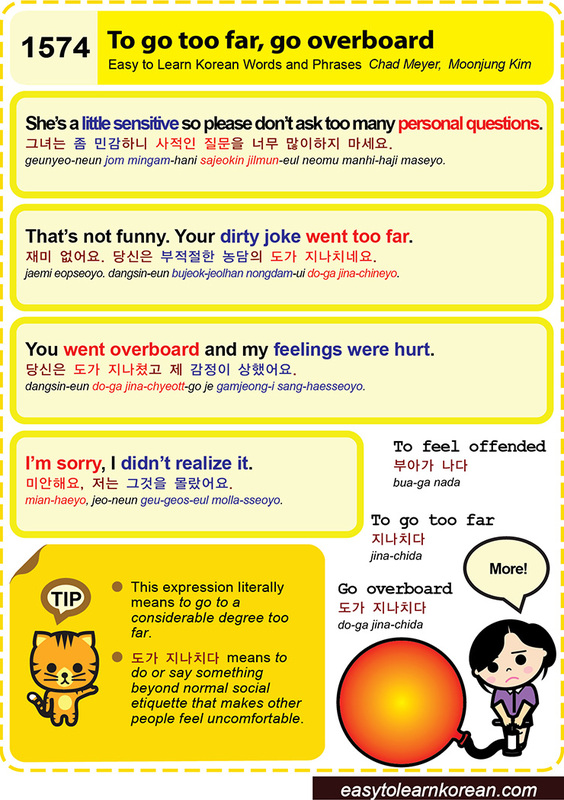 당신은 부적절한 농담의 도가 지나치네요., 저는 그것을 몰랐어요., 지나치다 by easykorean. Bookmark the permalink.